In the first part of my Accordance 10 review, I want to give a brief overview as well as highlight some new features in this version. Accordance is a Bible study program that offers a number of texts and tools for reading and studying the Bible. Like other programs we’re reviewing, Accordance offers a number of packages, called ‘collections,’ which include various numbers of texts and tools at various prices (see this comparison of all available). I will be reviewing the Essential collection, a combination of the Bible Study and Original Languages collections, along with a few extra resources. It retails for $499. I have used accordance since around 2008 (v. 7?). 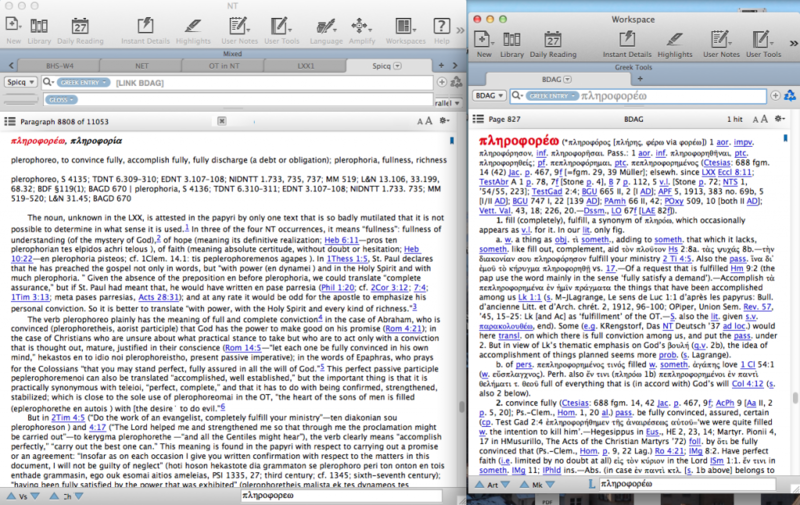 I recently received an upgrade from Accordance from v. 9 to 10. The following video provides a helpful overview for those who have never used the program. Additionally, one can find a free demo here. Windows. Though I don’t plan to use Accordance on a Windows machine, it is now available (as of Fall 2013). It is Windows native and includes nearly all the features of its Mac counterpart, with the exception of Dropbox syncing, Wifi syncing with iOS devices, 3D atlas functionality, text-to-speech, and spell check. One Accordance license will make the program available in either OS. Design. I used Accordance most in version 8, a bit less in version 9, but version 10 was noticeable different in appearance when I opened it up. Generally everything was still familiar, and I think most of the design changes have improved my experience. I don’t necessarily find the interface more or less intuitive than before, but I suspect brand new users are the best judge of intuitiveness. One of the new features I like as far as appearance is the unified window. Previously my workspace was made up of multiple floating windows which had to be moved and re-sized individually. This was especially a pain when I wanted to move Accordance to a new monitor since it required dragging each window. Of course, one can still open up additional workspaces (= new windows), and I typically like to have my main lexicon open in a separate window as below. Toolbar. The toolbar is now customizable, meaning the user can add, remove, and arrange icons as preferred. Those who used the library window a lot before will like having a library icon in the toolbar that will hide/show a library sidebar (left) as needed. Themes. These allow you to save the appearance (font, font colors, etc.) as you like. A number of preset themes are also available in the preferences menu. Flex Search. In addition to the standard searching functions, Accordance now offers ‘flex search’ which essentially expands a word/phrase search to include the query in various inflections or, in the case of a multiple words, to include results where there are intervening words between search terms. This is handy if you’re a bit fuzzy on what you’re looking for. Search All Bar. Now in the toolbar which is a good place for it. This allows you to search everything for, well, whatever you want. Analytics. When searching, a number of analytics are available such as graphic displays of search results. The design has improved in version 10, making this information more pleasing to the eye and perhaps better for using in presentations. Other Features. I’ve included what I feel are the most significant updates. For more, see this page. In the next post, I will focus more on how I use Accordance and what I think are some strengths to the program. (See part 2).